San Diego’s East Village is downtown’s largest neighborhood, encompassing 130 blocks bounded by Interstate 5 to the north and east, Sixth Avenue to the west and Commercial Street to the south. Once an industrial area, the East Village is now home to several educational institutions, condos, bars, restaurants, shops, and a re-emerging artists’ community. An eclectic mix of modern structures, old warehouses and funky historic buildings that have been converted for various uses give the neighborhood a hip urban vibe. When San Diego was incorporated in 1850, downtown became the city’s financial and cultural center. The adjacent East Village, then called Centre City East, became an industrial area, with warehouses, factories and a power facility. During the last decade, the East Village has been going through a transformation that has taken the previously rundown area and turned it into a chic urban place to live and play. 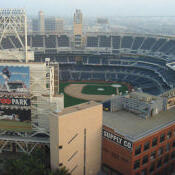 The catalyst for much of the new development was Petco Park, a baseball stadium built for the San Diego Padres in 2004. A recently released study by the local think tank National University System Institute for Policy Research analyzed the economic impact of the ballpark and found that the downtown area has added about 14,000 residential units and gained nearly 15,000 new residents. Once known for its vacant buildings, dive bars and thriving artists’ colony, the East Village has been transformed by redevelopment in the last decade, spurred by the construction of Petco Park in 2004. It is now home to chic condos, upscale restaurants, trendy shops and a new, state-of-the-art Central Library. The area also is trying to maintain its identity as an arts district with lofts, studios and galleries, and plans to turn much of the area into a cluster for technology and design-oriented companies. East Village redevelopment will continue for years to come, as it still has much underutilized space.